We have to say, fall is here! The sugar maples around the old green farmhouse are starting to turn color in places, the light is lower, more diffuse and more glowing, and we all had to wear sweatshirts this weekend while enjoying breakfast on the front porch. We love it! We’ll send out more reminders and details as we get nearer to the date, but all members are welcome. We will be making a big old pot of soup and cornbread, plus warm apple cider Leave your pets at home, but bring your kids, your muckin’ around boots, a side dish or treat if you’re inclined, and some time to enjoy the property! We’ll take people on a few tours, and have lawn games for those who’d like to relax. RSVPs are encouraged so we know how much to prepare for. We are SO EXCITED to see everyone and show off the permanent home of their CSA farm! In other farm news we’ve done a lot of seeding for the last few boxes of the regular share and for the fall extension boxes. We’re keeping an eye on the weather so we know when to scramble and pick everything for the frost-is-here-fajita box. We keep checking out the giant pumpkin, and it’s doing just fine! We’ll be saying a sad farewell to the sweet corn this week-and what a great run it’s been. Gracias! It also may be the last week for tomatoes for most members, so enjoy them! You may find either one of these in your beet bag this week: Chioggia on the left, Early Wonder Red on the right. Mediums and Fulls will be getting two different kinds of beans in their shares this week. 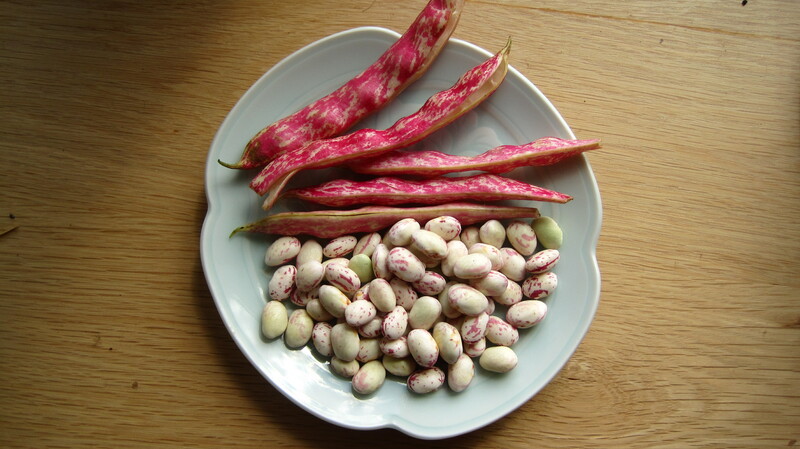 Romano Beans and Shelling Beans. Shell beans are the in-betweeners of the bean world. They aren’t meant to be eaten whole (pod and all), as you would a snap bean (aka “green bean”). They can be, but aren’t always, meant to be dried like a black turtle bean or a vermont cranberry. They are, in fact, meant to be shelled out of the pod fresh, cooked, and enjoyed for their creamy texture and lovely flavor. 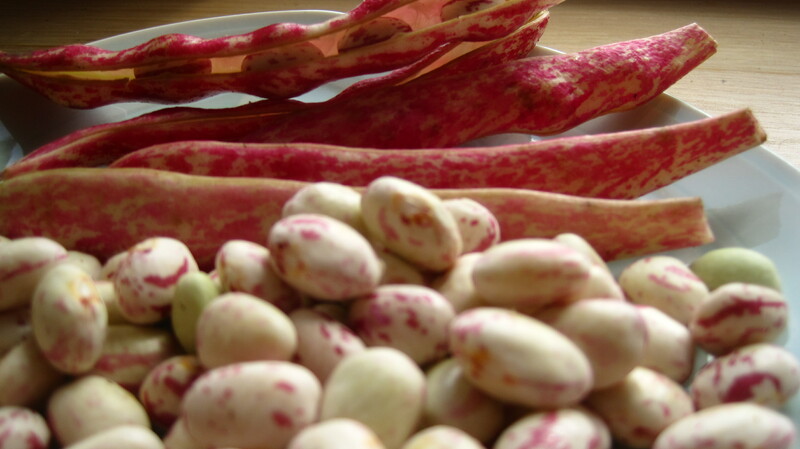 Still trying to grasp what, exactly, these gorgeous pink and white beans are? Well, edamame that you’d eat as an appetizer at a sushi restaurant is a shell bean. So are lima beans! Shell the beans out of the pod and cook in some broth or water until tender. They will take less time than a dry bean since they do not have to be re-hydrated. About a pound of unshelled beans will yield a cup of uncooked shelled beans. See some good ideas in the recipe section below. Celery is a new item this year for us. Notoriously finicky to grow in the midwest, we thought we’d give it a shot. You’ll notice that it is different than the ubiquitous California style celery that you’re probably used to. Less watery with a stronger flavor and an almost mint like aftertaste. A great example of how growing the same crop in different regions of the country can produce vastly different results. Shelling beans are pretty nifty and really quite a rare find. They have a very small window of availability, and for some reason they just aren’t grown by that many farmers anymore. The type you’re getting is the Tongue of Fire bean. If the weather turns a bit cooler at the end of the week, as predicted, give this Fresh Shell Bean and Tomato Stew a try. That stew is very close to the beloved Pasta e Fagioli, and we are giving you a recipe from last year was too good to stray from. It also mentions in detail the very same type of bean that’s in your box), and we’ll be enjoying it one of the cooler nights this weekend. You can even use your lovely Romano beans as the fresh green bean, and don’t even worry about the zucchini, we’re not using it either. Everyone gets sweet corn, tomatoes, and peppers this week, so I wanted to find some recipes that use them all together. It’s hard to believe it, but we’ve returned to soup weather here in the north, and this Roasted Corn and Tomato Soup seems like a great way to celebrate! There’s also this summer favorite to say farewell to until next year, the fabulous bread salad. You could also make this simple succotash. We had it with our burgers for our Labor Day lunch break and it was great! Corn and tomatoes are great with eggs, too, so why not something like this for a chill Sunday brunch? If you’re lucky enough to snag some Cosmic Wheel Creamery flavored quark (they’re at the Linden Hills Farmers Market on Sundays from 9 to 1, the Linden Hills Co-op, and Mill City Market) use that instead of the goat cheese. Or really, use ANY of her cheese. It’s phenomenal, and we are so proud of our dear friend Rama, who makes cheese of all kinds from cows born and raised on her own farm. 100% grass-fed, too!